For the King of France known as Philip the Bold, see Philip III of France. Philip the Bold (French: Philippe le Hardi, Dutch: Filips de Stoute; 17 January 1342 – 27 April 1404, Halle) was Duke of Burgundy (as Philip II) and jure uxoris Count of Flanders (as Philip II), Artois and Burgundy (as Philip IV). The fourth and youngest son of King John II of France and his wife, Bonne of Luxembourg, Philip was the founder of the Burgundian branch of the House of Valois. His vast collection of territories made him the undisputed premier peer of the kingdom of France and made his successors formidable subjects, and sometimes rivals, of the kings of France. Born in Pontoise in 1342, Philip gained his cognomen the Bold at the age of 14, when he fought beside his father at the Battle of Poitiers of 1356 and they were captured by the English. He remained in the custody with his father until the terms of their ransom were agreed to in the Treaty of Brétigny of 1360. He was created Duke of Touraine in 1360, but in 1363, he returned this title to the crown to receive instead the Duchy of Burgundy in apanage from his father as a reward for his courage at the Battle of Poitiers. His father had been the ruler of the duchy since the death of Duke Philip I in 1361. Philip would rule the duchy as Philip II until his death. He was actually the stepbrother of Philip I of Burgundy, whose mother Joan was married to King John II of France, Philip the Bold's father, as his second wife. On 19 June 1369, Philip married the 19-year-old Margaret of Dampierre, daughter of Louis II, Count of Flanders, who would become the heiress of the County of Flanders, the Duchy of Brabant, the County of Artois, and the Free County of Burgundy after the death of her brother in 1376. Margaret became the widow of Philip's stepbrother Duke Philip I of Burgundy while still a child of about 11. As her father's eventual heiress, Margaret would bring rich possessions to Philip the Bold and his children. In 1390, Philip also became the Count of Charolais, a title used by Philip the Good and Charles the Bold as the heirs of Burgundy. Philip was very active at the court of France, particularly after the death in 1380 of his brother King Charles V, whose successor Charles VI became king at the age of 11. During Charles' minority, a council of Regents was set up to govern France that was made up of four of his uncles: Louis, Duke of Anjou, John, Duke of Berry, and Philip himself from his father's side, and from his mother's side, Louis II, Duke of Bourbon. Among Philip's acts while regent was the suppression of a tax revolt in 1382 known as the Harelle. The regency lasted until 1388, always with Philip assuming the dominant role: Louis of Anjou spent much effort fighting for his claim to the Kingdom of Naples after 1382 and died in 1384, John of Berry was interested mainly in the Languedoc and not particularly interested in politics, and Louis of Bourbon was largely an unimportant figure due to his personality (he showed signs of mental instability) and his status (since he was not the son of a king). However, Philip, along with John of Berry and Louis of Bourbon, lost most of their power at court in 1388, when Charles VI chose to favour the advice of the Marmousets, his personal advisors, over that of his uncles when he attained his majority. In 1392, events conspired to allow Philip to seize power once more in France. Charles VI's friend and advisor Olivier de Clisson had recently been the target of an assassination attempt by agents of John V, Duke of Brittany. The would-be assassin, Pierre de Craon, had taken refuge in Brittany. Charles, outraged at these events, determined to punish Craon, and on 1 July 1392 led an expedition against Brittany. While travelling to Brittany, the king, already overwrought by the slow progress, was shocked by a madman who spent half-an-hour following the procession to warn the king that he had been betrayed. When a page dropped a lance, the king reacted by killing several of his knights and had to be wrestled to the ground. Philip, who was present, immediately assumed command and appointed himself regent, dismissing Charles' advisors. He was the principal ruler of France until 1402. His seizure of power, however, had disastrous consequences for the unity of the House of Valois and of France itself. The king's brother Louis, Duke of Orléans, resented his uncle taking over as regent instead of himself; the result was a feud between Philip and Louis that continued after their deaths by their families. In particular, both quarrelled over royal funds, which each desired to appropriate for his own ends: Louis to fund his extravagant lifestyle, Philip to further his expansionist ambitions in Burgundy and the Low Countries. This struggle only served to enhance the reputation of Philip, since he appeared to be a sober and honest reformer in comparison to the profligate and irresponsible Louis. Although Charles VI confirmed his brother as regent in 1402 in a rare moment of sanity, Louis's misrule allowed Philip to regain control of France as regent in 1404, shortly before his death. In 1395, Philip the Bold outlawed cultivation of the Gamay grape in favour of Pinot Noir in an early example of agricultural regulation related to wine quality. Philip died in Halle, County of Hainaut (modern Belgium), on 27 April 1404. His territories were bequeathed to his eldest son John the Fearless, who also inherited Philip's political position in France and the leadership of the Burgundian branch of the Valois family against the Orléans branch. In 1378, Philip the Bold acquired the domain of Champmol, just outside Dijon, to build the Chartreuse de Champmol (1383–1388), a Carthusian monastery ("Charterhouse"), which he intended to house the tombs of his dynasty. His tomb, with pleurants and his recumbent effigy, is an outstanding work of Burgundian sculpture. They were created by Jean de Marville (1381–1389), Claus Sluter (1389–1406) and Claus de Werve (1406–1410). Jean Malouel, official painter to the duke, was responsible for the polychrome and gilt decoration. After his death, the body of Philip the Bold was eviscerated and embalmed, then placed in a lead coffin. It was then deposited in the choir of Chartreuse de Champmol on 16 June 1404. His internal organs were sent to the church of Saint Martin at Halle. In 1792, his body was transferred to Dijon Cathedral, and in the following year, his tomb was damaged by revolutionaries and looters. It was restored in the first half of the 19th century and today it is in housed the former palace of the dukes, now part of the Musée des Beaux-Arts de Dijon. In arranging the marriages of his children, Philip followed an intelligent diplomatic and strategic design that would be followed by his successors in Burgundy as far as Emperor Maximilian I. For example, the double marriage in 1385 at Cambrai of his son, John the Fearless, and his daughter, Marguerite, to Margaret of Bavaria and William of Bavaria, son and daughter of Albert, Count of Hainault and Holland, prepared the later union of Hainault and Holland with Burgundy and Flanders, as carried out by Philip's grandson, Philip the Good. The marriages also inserted the new Valois Burgundy dynasty into the Wittelsbach network of alliances: the other daughters of Count Albert married William I, Duke of Guelders and Wenceslaus, King of Bohemia; their cousin, Isabeau of Bavaria married Charles VI of France, and became Queen of France. In addition to his alliance with the low county Bavarians, Philip also made links with the Dukes of Austria and of Savoy by marrying his daughter Catherine to Leopold IV of Austria and his daughter Mary to Amadeus VIII of Savoy. 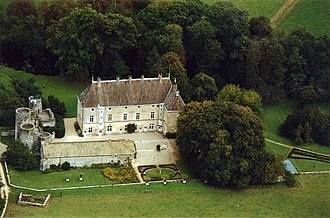 The Château de Germolles in Burgundy. Few of Philip the Bold's residences are still extant. Apart from several elements of the ducal palace in Dijon (Tour de Bar), the Château de Germolles is largely preserved. This residence was offered to his wife, Margaret III, Countess of Flanders in 1381. The princess transformed the old fortress into a luxurious home with the help of artists from the Burgundian School Claus Sluter and Jean de Beaumetz. ^ Vaughan 2009b, p. 152. ^ Vaughan 2009b, p. 3. ^ a b Vaughan 2009b, p. 16. ^ Vaughan 2009b, p. 40-41. ^ Vaughan 2009b, p. 42. ^ Vaughan, Richard (2002). Philip the Bold: The Formation of the Burgundian State. Woodbridge, England: The Boydell Press. p. 42. ISBN 085115915X. ^ Vaughan 2009b, p. 56-57. ^ Vaughan 2009a, p. 198. ^ Vaughan 2010, p. 31. Vaughan, Richard (2009a). John the Fearless. The Boydell Press. Vaughan, Richard (2009b). Philip the Bold: The Formation of the Burgundian state. The Boydell Press. Vaughan, Richard (2010). Philip the Good: The Apogee of Burgundy. The Boydell Press. This page was last edited on 18 November 2018, at 02:16 (UTC).